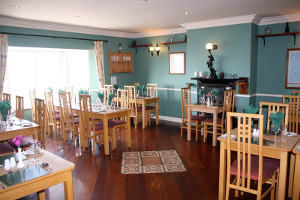 The Old Pier Restaurant (Seana Ché in Irish) offers a wide range of locally-caught fresh seafood, prime steak and meat dishes daily. We have an extensive Á La Carte menu to suit all tastes and budgets. We also offer House Specials that range from Surf and Turf of Lobster and Steak, to Dover Sole, John Dory, Monkfish, Crab, Hake, Squid, and whatever the sea provides on the day. We have been extensively reviewed by many and heartily recommended by all, including Georgina Campbell’s Ireland Guide. 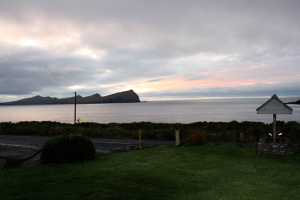 With panoramic, breathtaking views of the sun setting every evening, the Old Pier Restaurant is the perfect, romantic location to end your day touring the Dingle Peninsula. The National Geographic Traveler described Dingle as “the most beautiful place on earth” and in this idyllic spot The Old Pier enjoys a superb location on the edge of the water with magnificent views of Atlantic Ocean and Harbour, just a 15 minute drive to the heart of Dingle town. Or, for the perfectly relaxing meal, what not retire upstairs to one of our luxury guest rooms to enjoy the perfect dinner, bed & breakfast experience? Book one of our luxury self-catering homes nearby and enjoy a complimentary bottle of house wine when you dine in the Old Pier Restaurant.